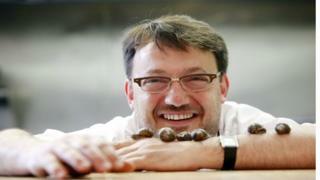 A French chef has called for snails and fish heads to be served in Scotland’s schools to help combat child obesity. Fred Berkmiller, who owns two Edinburgh restaurants, says meals such as chicken nuggets and chips should be replaced. He argues that radical changes to school menus could demonstrate that ministers are serious about improving the nation’s health. The comments came as the Scottish government began a consultation on its diet and obesity strategy. The government consultation has plans to restrict supermarket promotions on foods high in sugar, salt and fat. Mr Berkmiller believes that processed or deep fried foods should be removed from schools and he argues that molluscs should be served nationwide instead. He said wild snails, which are sourced from Barra for his restaurants, are nutritious and would help children become more interested in what they eat at lunchtime. Mr Berkmiller also recommends an old Scots recipe for fish heads which are stuffed with brown crab meat and steamed in the oven. In addition to serving snails and fish heads he suggested that pupils should grow their own vegetables and have a kitchen so that they can learn how to cook and eat more healthily. He also believes that keeping poultry and even killing them could help to educate children. “Let’s try and stop talking about the export of whisky or the export of salmon. Lets talk about our kids and get them into food education,” he said. Food justice charity Nourish Scotland has backed Mr Berkmiller’s calls but says that it is a wider issue than just schools with two out of three Scottish adults being overweight or obese along with one in three children.